Children in Hiroshima grow up, year round, in the shadow of the A-bomb Dome. Standing in the heart of the city, the skeletal remains of this once-stately stone building are a grim reminder of the horror of nuclear weapons and war. Sixty-eight years ago today, the city that I now call home became a vast, burnt graveyard. I have lived in Hiroshima for almost 17 years, and my children were born here. Now 9 and 6, they have learned about the history of this city, bit by bit, over the years, but grasping a catastrophe that even adults find difficult to fathom is no easy task for a small child. What do my children think about the atomic bombing, about war, about peace? Today I sat down with my kids and asked these questions. The highlights of our discussion—carried out in English, their minority language—reveal the extent of their understanding and perspective at this point in their young lives. Me: Today is August 6. 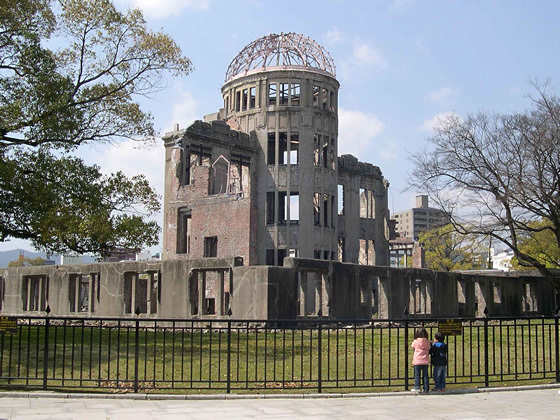 Why is today an important day in Hiroshima? Lulu (9 years old): It’s the day the bomb was dropped. Roy (6 years old): America and Japan were fighting. Me: What kind of bomb was it? Lulu: It was an atomic bomb. I know all about it. Me: Okay, when did this happen? When did the bomb explode above the city? Lulu: I was going to say that! Me: Was it 8:15 at night? Lulu: No, in the morning. And it was a hot day. Me: So the bomb exploded at 8:15 in the morning, in the air above the city. Roy: And the A-bomb Dome. Me: People in other countries know that a lot of people were killed by the atomic bomb. And many people have seen a picture of the huge mushroom-shaped cloud above the city after the blast. But they don’t really know what happened to the people on the ground when the bomb exploded in the sky. Do you know what it was like for the people on the ground? Me: Why did they die? Lulu: Because there was a great big fireball. Roy: Some people jumped into the river. Me: They were trying to escape, weren’t they? Roy: But there was stuff like poison in the water, so they drowned or died. Me: Where did the poison come from? Lulu and Roy: From the bomb. Lulu: And after that, there was black rain. Inside the rain was the poison. Me: What’s that poison called? Do you know? Me: It’s called radiation. And why is radiation bad for people? Lulu: When it gets in your body, it doesn’t kill you right away, but then you get weaker and you die. Like Sadako. 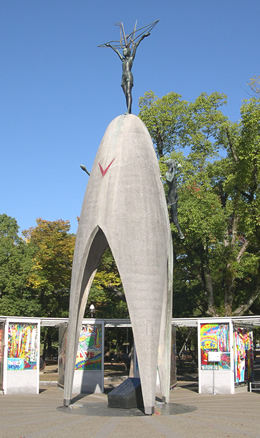 Sadako and her paper cranes were the inspiration for The Children’s Peace Monument, unveiled in Peace Memorial Park in 1958, three years after her death from radiation-induced leukemia. Me: Yes, Sadako Sasaki, the girl who folded the paper cranes. She died about ten years after the bombing. She was only two when the bomb exploded, but when she was 12, she got sick because of that radiation in her body. She had to go into the hospital and she started folding the paper cranes there. Do you know why she folded paper cranes? Lulu: Because she wanted peace. Me: Well, in Japan, there’s a legend that says if you fold 1,000 paper cranes, your wish will come true. And Sadako’s wish was to get better, to get well again. That’s why she folded the paper cranes. And today they’re a symbol of peace, right? People fold paper cranes, thinking about peace. Lulu: I can make a paper crane. Me: Roy, what do children in Hiroshima do on August 6? Do they do anything special? Roy: They go to school. Me: During summer vacation? Why? Roy: (clasping his hands together) To pray. And to put your head down. Me: And what do you pray? Roy: No more bombs will explode. Me: What do you pray, Lulu? Lulu: The same thing. Everyone prays the same thing. No more bombs. Me: Lulu, what else happens in Hiroshima on August 6? Lulu: Some people go to Peace Park and they pray at 8:15. After that, they have, like, pigeons and they let them go. Me: I think they’re doves. Me: They’re white. They’re doves. Lulu: I think they have pigeons in there, too. Me: So why do people fight and have wars? Roy: Because one person wants something from another country and another person comes to get it back. And they fight about it. Then other people come and they fight, too. Then lots of people come and they fight about it and it begins a war. Me: I see. But grown-ups tell kids not to fight, right? But then grown-ups fight and have wars. Does that seem strange to you? Lulu: They’re telling it to the kids, but if they don’t stop, it doesn’t make any sense! Me: What do you think about war? Me: What’s bad about it? Me: Is there anything we can do to stop war and make a more peaceful world? Lulu: Don’t fight. And also, when you start a war, one country has to give up faster. Me: But what if they both want the same thing? Lulu: They can just say, “You can have it,” like that. Me: But what if they both really want it? Me: If you could tell everyone in the world, all the grown-ups and kids, something about war and peace—some kind of message—what would you say? Me: Sharing is important. Are you guys good at sharing? Me: You’re not good at sharing? Me: When you don’t share, does it cause a fight? Lulu: Yeah, and then it goes on and on and on. Me: What do you guys fight about? Lulu: Like when we were playing with Lego. I was making it first, then Roy broke mine and I said, “Stop!” But he said, “Nya, nya, nya” and that started the fight. Me: Roy, you weren’t sharing your Lego? Me: But you just said, in your message to the world, that sharing is important. Me: But if you don’t share, what’s going to happen? Me: So what can you do, in your life, to help make a more peaceful world? Roy: And when there’s a war, I’m going to walk through the war and I’m going to look at what they’re fighting about—I’ll look very closely. And then I’ll go back to my house and I’ll make the same thing. Me: Oh, you’re going to make another one so they won’t fight over it anymore? Lulu: But how about if it looks junky and it doesn’t look the same? If it doesn’t look the same, they’ll keep fighting. Roy: I won’t make a junky one. Me: But what if they’re fighting over land? You can’t make more land, right? What are you going to do? Me: I have one more question. Your hometown is Hiroshima, right? What do you think about that? Is that something important? Lulu: It’s something important because we can tell other people about the bomb and exactly what happened. Me: Why do other people need to know about this? Roy: Because it’s really bad and a lot of people died. Me: Are there still bombs in the world, like the atomic bomb? Lulu: Yes. No more bombs! How about you? Have you talked to your children about war and peace? What do they think about these difficult things? really touching.. i’m gonna cry…. Wow, this really brought tears to my eyes…both because what happened was really awful, but also because your children’s replies are really wonderful and touching! Really nice post. I tend to shy away from difficult topics with my daughter (although she’s only two) but your kids are showing maturity and thoughtfulness in their answers–you’ve inspired me to be less of a protective parent and think about engaging her on her level. Many thanks! Wonderful discussion! Great kids! They really really could relate it to their own lives! Have a peaceful lego playing kids! I’m grateful for your comments, everyone. I’m glad this post spoke to you. Fascinating! I visited Hiroshima a decade ago and was so affected by it. I love the explanations your kids give, at such a young age, it’s wonderful. Amanda, it’s great that you had the chance to visit Hiroshima. I honestly think the world would be a more humane place if somehow the experience of Hiroshima could be shared more broadly with others, and especially politicians. If you ever happen to pay another visit—and this same invitation holds for everyone else out there, too—please feel free to get in touch with me for a personal tour. Very touching post Adam, and your kids are very mature and knowledgeable. I have never been to Japan, but have visited a concentration camp in Germany and I agree everyone should visit these type of places to get an idea of how awful and destroying wars can be! Sami, I once visited Terezin, a concentration camp in the Czech Republic, and found it very moving. I hope one day I’ll have the chance to return to the Czech Republic (I was a U.S. Peace Corps Volunteer there years ago) and pay another visit with my children. Hi! It is very moving to see the story through the eyes of children. I’m recommending this post on twitter. Peace! Marta, peace to you, too. Thank you for sharing this post with others. I was in Adelaide (the capital city of South Australia), many years ago (58 or so) when there was a special exhibition at the Art Gallery of SA, by a Japanese artist. He had painted scenes of what happened at Hiroshima and Nagasaki on a many metres long ‘scroll’ of what looked like butcher’s paper, and it was pinned up around the four walls of one of the Gallery rooms. Although only 12 or 13 at the time, I’d read quite a bit of the history of those events and personal stories of some of those who had survived – and cried for them. Seeing his depiction of the horrors brought me to tears again and fresh-shocked realization of what it was really like to be there at the time and afterwards. Lulu and Roy, we all have a part to play in bringing peace to the world. It starts with each of us as individuals surrounding ourselves with peace and working outwards from there. Lorizin, thank you for your thoughtful comment. I will be sure to share it with my kids. I send a warm wish for peace from Hiroshima.